exception.They are more like the skates and rays that have their multiple gill openings on the underside. All sharks in New England will have 5 pair of gill openings. There are approximately 500 species of sharks around the world. Most of them have five pairs of gill openings. and they are not in the New England area. of these scales will vary depending on the shark species. skin. The silky shark has relatively smooth skin. tail lobe, as you can see on the zebra shark below. other requirements of shark classifications. a foot long, and several are over 20 feet long. categories they use the following methods. species in 2017, put into 34 shark families. 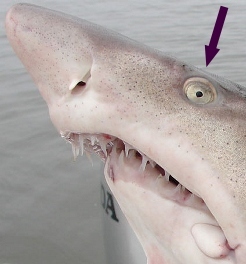 Not all sharks have eye protection called nictitating membranes. 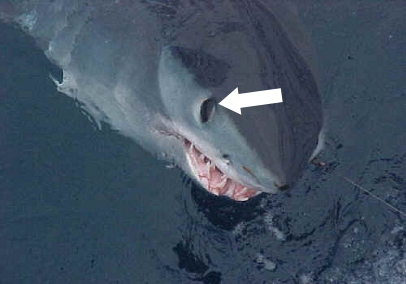 There are many shark species that lack this type of eye protection. They can roll their eyes back into the eye socket for protection. the white, shortfin mako, porbeagle, thresher, sand tiger, dogfish, and basking shark. difficulty it is in. 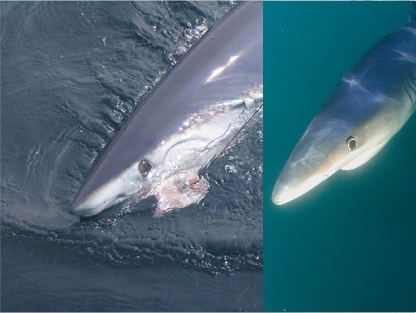 The blue shark below right, has brought up it's nictitating membrane for protection. It's easy. 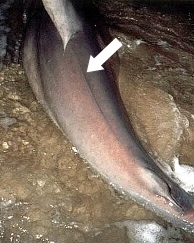 A male shark will have two claspers extending from his pelvic fins. 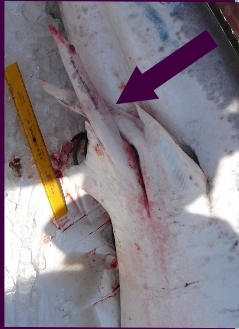 The male's two rod like white claspers are visible in the picture below on the right. 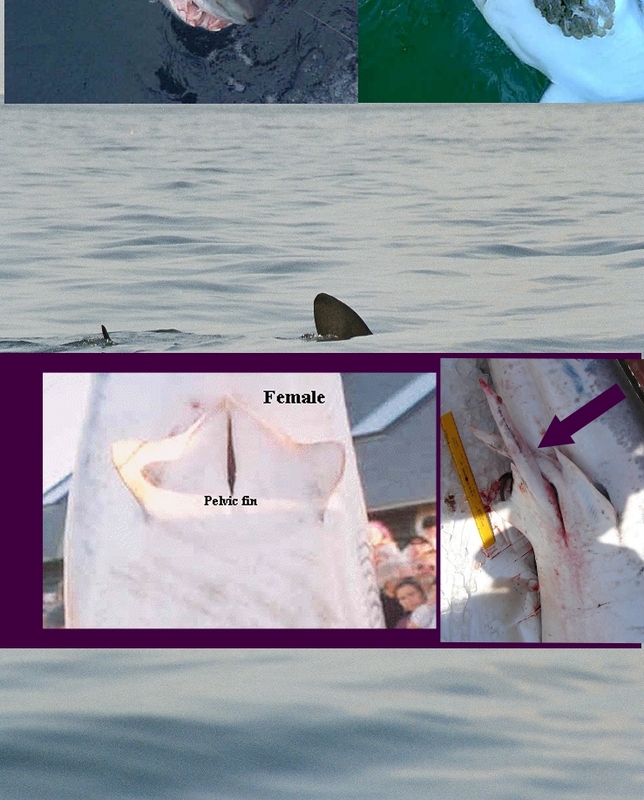 A female will not have claspers as shown in the photo below on the left. In case you are wondering only one clasper will be used during mating. and found out only one clasper is "roughed up'. having a fairly large second dorsal. 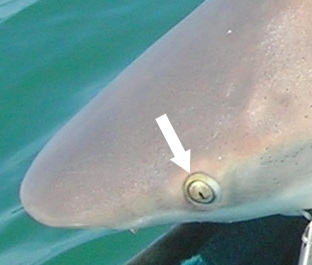 Rigid pectoral fins are a characteristic most sharks share in common. The shark's pectorals don't fold back against the body as they do in other fish species. little if any bone in their bodies. So there aren't any fossilized bony skeletons with rib cages to analyze. to this. Their book Fishes of the Gulf of Maine was written from hands on experience over 60 years ago. migratory patterns, and age /growth studies. 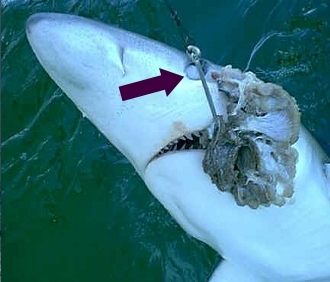 I will give you a couple of examples of how gathering shark information has been a slow process. biologists peeing in the ocean." These anecdotes will give you an idea of how far behind the times shark researchers were. shark, Lamna ditropis, wasn't classified as a separate species until 1947, a passage of 159 years. classified as a separate species until 1966.
not separate species as was implied in the past. that may reach 18 feet in overall length, was not documented until 1976.
claimed in 2011 that these two species have interbred. many of the existing species. The so-called shark experts of the past knew very little about sharks. ridiculous. Unfortunately some of that mis-information still persists to this day. look like to you and me at a distance.